Over the winter holidays, I decided we would embark on a crystal and cave inquiry. This inquiry was teacher driven, but allowed for a ton of student voice, choice and curiosity to guide where our learning took us. When thinking about the Types of Student Inquiry, I always refer to Trevor MacKenzie’s concept from his book Dive Into Inquiry. This sketchnote allows us to really grasp the concept of where we are in the inquiry swimming pool, and how we can best support our learners in developing the necessary inquiry skills and processes to feel successful in inquiry. This crystal and cave inquiry falls under the controlled section of the Types of Student Inquiry. I initially chose the topic and found the resources that would guide the learning. We are focusing on asking deep questions, following our interests, researching using non-fiction texts and as a group inquiring about caves & crystals. We also ended up having some choice and agency over animals, as our inquiry spiraled into learning about which animals live in caves. We were hoping to answer the essential question: Which types of animals live in caves? We had the opportunity to choose which animal we were interested in and we created small research focus groups to research about our animal. All powerful inquiries begin with some type of provocation; whether the provocation comes from your learners or yourself it usually can be pinpointed to a specific moment that sparked interest, curiosity and laid the land for the rest of your inquiry. Here are some of the provocations that guided our learning and research during our cave & crystal inquiry. Check out this provocation sketch from our (Trevor and I) co-authored book: Inquiry Mindset. We started with a cave to explore, and a crystal and gem discovery table! Using picture and non-fiction books at your discovery and research table can be powerful provocations as well. We then had some growing crystal provocations. This led to a lot of crystals, gems and home grown crystals being brought in from home. I find sharing our learning and inquiry, through pictures and videos, on Fresh Grade truly helps to break down any boundaries between school and home. You know the home to school connection is strong when families are sending in books, rocks, gems, geodes, crystals… the list goes on. As our provocations and crystal observing continued, I wove in some animal provocations, small world play areas and picture books, to spark some connection making to animals. We followed our picture book provocations with journaling and writing activities. I find this allows time for learners to process the information and provides them with a chance to share their thinking, voice and opinions from the reading provocation. This is where our essential question came up around: What types of animals live in caves? As our interest and curiosity continued to build around the idea of animals, so did our crystal and mineral interest. We used a digital microscope to take pictures of our crystals, this sparked SO much discussion, energy and engagement. The oral language (in French) during this activity was off the charts! So beautiful and intriguing. As our learning continued, we worked in small interest focus groups for research. Our research was focused on which types of animals we predicted live in caves. We brainstormed different animals we thought lived in caves, and then chose an animal that we were most interested and passionate about. These small research focus groups provide learners with choice, voice and agency over their learning. Students have ownership of their learning and are chomping at the bit to get researching. We researched using non-fiction texts, reading pictures and searching for information. We recorded our research in our research booklets. These are some highlights from our cave and crystal inquiry! If you are interested in seeing a bit more about how things unraveled, please check out my Instagram highlights: Cave Inquiry. My Instagram handle is @inquiryteacher ! I always get asked well how do you start an inquiry? How do you know if they are interested in a topic? How do you know if the kids have prior-knowledge in an area, or if you have to build it? Provocations, provocations, oh yeah and…provocations! Here is a little sneak peek of our upcoming book, Inquiry Mindset. If you haven’t checked out my amazing co-author, Trevor MacKenzie, you’ll be blown away. This sketchnote sums up the power behind a provocation. This is just one of the sketchnotes in our Inquiry Mindset book, we can’t wait for you to see more. A provocation can be a beautiful set up, an image, a GIF, a picture book, an activity, a video clip, a field trip, materials, a nature walk, etc. to spark curiosities around and about an inquiry topic or idea. We use provocations with our learners to ignite inquiry. We observe, record and reflect on the discussions, interactions and creative ideas that are switched on by the provocation. If all goes well, provocations lead to beautiful and deep learning. They help to drive and guide inquiries. At times, they can also show us that the topic is perhaps not driving a ton of questions and passion, so something may need to be tweaked. I would love to see your favourite provocations! Share them to our online community to inspire your colleagues using our #InquiryMindset hashtag. Beyond excited to share a sneak peek into a big project Trevor MacKenzie and I have been working on together! We LOVE inquiry and have lots of practical and ready to implement ideas coming your way. We have been sharing information with those of you who are part of our newsletter. If you are not yet in the loop and wish to be click here to join. Can’t wait to share more in the next few weeks. Stay posted! Here is a quick glace at part of our design. Throughout November and December, we continued to inquire and learn about ourselves and in turn learning about our families became our jam. To read about how we have been connecting to our place and self see my last post: here. We had been exploring down a path inspired by Adrienne Gear‘s work, specifically her ‘We Are All Connected’ workshop. To see her package of resources and links to beautiful picture books click here. As I shared in my previous post, we had visited the beautiful Royal BC Museum to spark this self inquiry, and honed in on what a family is, what family means to us and had us thinking and wondering about our families. From our visit, many tradition and celebration discussions and wonders were exchanged. “I saw a button blanket at the Museum, I wonder if it the same one as my Grandma has at her house?” -L.
In inquiry, when powerful questions surface -we follow them! Our job, as the Inquiry Teacher, is to be part of the inquiry as well. We can curate resources to keep the question alive. Our role is to nurture the question and provide experiences and time to go deeper with the thinking behind the question. We followed down this button blanket path, as many of our learners were curious as to what is a button blanket, and why did L’s Grandma have one? We borrowed a district kit and learned about button blankets. We explored different patterns, shapes, animals and shared our thinking. We used Padlet to make our thinking and questions visible. We created a visual wonder wall. Interested? Here is the link. Padlet is a great tool for creating visual wonder walls or whole group brainstorms. It is great way to share with the families in your learning community to engage and connect them with your learning. We followed in the direction of a few different picture books. We spent some time reading and retelling “Mama Do You Love Me? by Barbara M. Joosse. We loved reading and learning about how families come together in “My Family Tree and Me” by Dusan Petricie. This story has two sides, one is about the Father’s family and leads you to a family portrait, and the other side (starts at the back) is about the Mother’s family and leads you to the same family portrait in the middle. Super neat, the children loved it! We also read about different types of families in “A Family Is A Family” by Sara O’Leary. This story resonated with lots of the children in our class and sparked discussions about how our families are different and similar. I teach French Immersion but do not, and will not, stay clear of beautiful picture books. We spend time talking about vocabulary and a lot of French ‘ad libbing’ is involved when reading these books. As we continued learning about our families, we learned about family trees and how they can be used to document who is in our family and what generation they are from. We also learned about circular forms of documentation, shared by Adrienne Gear, and kept our learning documented in a circular format. Adrienne Gear’s has this form of documentation as a resource. I tweaked ours a little bit to fit our learning path. Adrienne’s version has more circles as it is proposed for Grade 2 or 3 learners, and touches on community. Ours has a circle for self, family, home and then the outer layer is for land. For family we worked on illustrating who was in our family and labeling them with initial sounds. Documenting our learning process is one way to make learning and growth visible. It helps celebrate the learning process, and highlights our thinking. We also learned about Totem Poles and how they can represent traditions, stories and families. We loved reading “Sometimes I Feel Like A Fox” by Danielle Daniel. The book explores the idea of traditional Indigenous meanings and teachings that are represented by animals, this links well to Totems and our learning about our District’s Spirit of Alliances. We talked about the different teachings presented in the book and thought about which animals represent our family members. Congruently we were doing a lot of story retelling about Foxes, so it was quite fitting to do an art activity inspired by this book. I love when our learning overlaps and becomes full circle, so neat. We also created heart maps of our families. I tend to do this project every year, as it is so beautiful. It is inspired from the book “My Map Book” by Sara Fanelli. I typically bring it out around Valentine’s Day, but thought it would be fitting to surface during our family discussions and have a focus on family. The children worked, quite independently, on creating maps of their heart to demonstrate the members in their family. They all were unique, some had initial sound labels and others had names and words from a word bank. Our family journey ended up being much more complex and deep than I had originally planned for, but that is the beauty of working with inquiry. Unexpected turns and conversations spark, and when we’re open to following them and exploring the questions that arise, beautiful learning happens. I would love to hear of the picture books you find useful to spark family and self conversations. What are some ways you are connecting to the idea of family in your classroom? The more I read about Indigenous ways of learning and knowing, the more I realize the importance of having young learners feeling connected to the land they live on and being aware of themselves as individuals and their own stories. I continue to read, over and over, that young people need to first understand their connection to our land in hopes of embracing other cultures, specially local Indigenous culture. Beginning by exploring in our environment and about ourselves has been our soundtrack lately, and boy have we been ever loving it. We love exploring outdoors. We love running, jumping, hiding and of course throwing leaves. We love jumping from tree trunk to tree trunk in our nature playground. We love holding hands and running across the field. We love our place of learning. We have been curious about the type of tree we have in our school yard. We think it is a London Plane tree. We love finding it’s fruit/seeds that are all over the grass right now. We recently partnered up with a class in West Vancouver to do a nature exchange. We were inspired by the NaturePal Exchange. Both of our Kindergarten crews collected local nature and items to mail and exchange. We spent time sharing, identifying and labeling our items and they are being shipped off. We are excited to receive our package and learn about the nature and the place of learning our Kindergarten friends have in West Vancouver. What a neat way to learn, explore and connect to our place. We spent countless outdoor explorations combing the school yard for interesting finds. Our friends started bringing in items from weekend adventures and backyard finds. Here is part of package we are sending. Learning about ourselves sparked when we visited the Royal BC Museum’s Family & Belongings a few weeks ago. We were entranced by artefacts that families used ‘back in the day’. This led us to beginning to inquire about ourselves and families. I was beyond fortunate to attend a workshop by the incredible Adrienne Gear based on how ‘We are all Connected’. Click here to link to resource package and amazing list of books. It was such a timely experience as our inquiry was just beginning. Adrienne blew my mind, gave me chills and made me tear up… ALL IN A WORKSHOP. All the books and resources she shared fit SO well with our current learning and where I was hoping to head towards for the remainder of first time. We have been loving inquiring about ourselves, beginning with Adrienne’s suggestions of starting with the stories of our names. 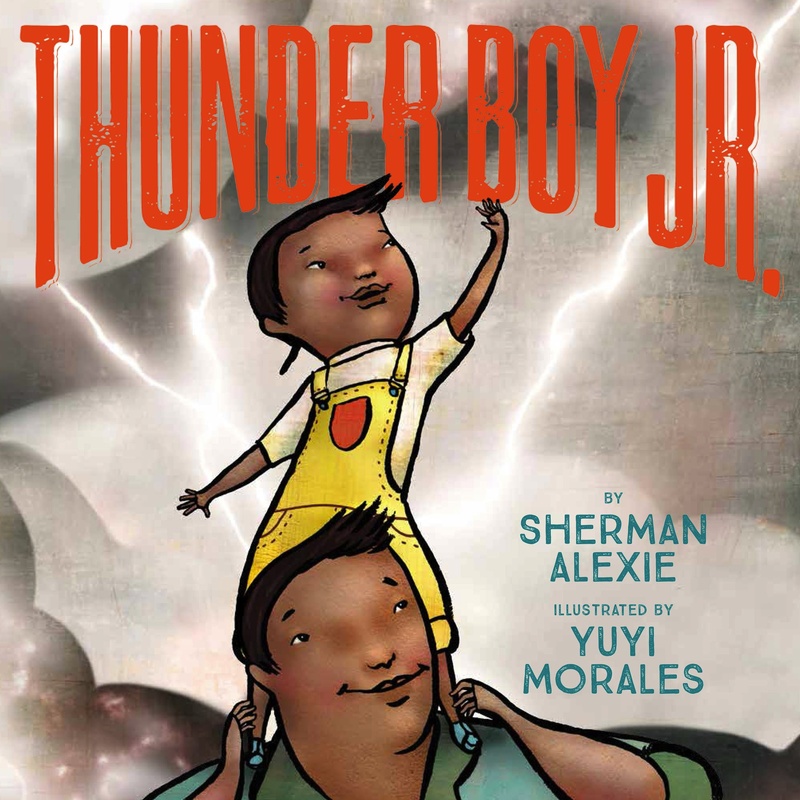 We loved Adrienne’s recommendation of reading Thunder Boy Jr. by Sherman Alexie. We’ve read it three times, the first time in English and the two other times in French (‘ad-libbed’ of course). I loved Adrienne’s idea and suggestion of sending home Name Story interviews. How powerful for families to be part of our learning and inquiring process! We sent home paper interviews for the children to complete with their families, and I also offered and encouraged our families to record their interview with their child and post their child’s name story on Flip Grid. If you haven’t checked out Flip Grid it is almost like a virtual wonder wall, where learners can record short clips of themselves reflecting and sharing. It is an easy to use platform, that can be accessed via desktops, laptops and tablets. There is a user-friendly app that connects to your Flip Grid board using an access code and password (if you wish). We received more than half of our reflections via Flip Grid and some awesome paper interview versions as well. The children LOVED watching their videos and listening to their paper versions of their interviews with their families. Lots of giggles, especially when we heard what each child would love to change their name to… strawberry shortcake probably received the most giggles. Thanks for sharing in a few ways we are working on connecting to the local land we live, learn and play on each day and learning about some of the ways we have been inspired by Adrienne Gear to inquire about ourselves and the stories of our names. How do you connect to your place or learning? How are your learners connecting with their own stories? Wonders, interests and curiosities are just waiting to be sparked. Once they are, it is my role to honour and nourish them so they can grow into a deep learning experience for my learners. This post outlines practical ways to honour and nourish an inquiry that develops from the interest and choices of your learners. It all started out with creating bird nests outdoors and here is where our journey continued to. Outside, my learners were very interested in building birds nests. This activity was sparked organically. They planned, gathered, collaborated and created. They problem-solved, used oral language to discuss, laughed and shrieked with excitement. I hope some of the following practical ways I supported my learners in extending their learning and thinking will inspire you. Book Baskets: I realized the interest and wonders about birds was contagious and my learners were beginning to ask questions about birds and building birds nest during our free exploration time. I decided to fill our morning book baskets with non-fiction bird books. A colleague of mine, Leilani Roberts, inspired me to try morning book baskets this year. I have two large baskets on the carpet, each morning, filled with non-fiction texts for the children to explore. I have added post-it notes so they can mark interesting images, or pages they have questions about. Then we can explore them together as a group. Provocations: I set up various provocations around the room: a bird research centre, paper bag nest making, and for the win a clay bird nest making tote. The tote was such a success! They loved rolling, modeling and creating little bird nests and using bird figurines for dramatic play. Morning Story Inquiry: Each week we focus on inquiring about a different picture book. We wonder about the characters, setting, vocab words (as we are learning French), and the different ways we can retell the story. I decided to weave in stories that focused on birds and that would inspire us to retell and recreate bird stories of our own. Monday I introduce the book and we do a whole group retell. Tues through Thursday we build and create using various materials from our story inquiry shelves. On Fridays it is a free build or choice to retell through drawing and painting. The children love having choices in how they show their understanding and learning from the week. Class Play: We started learning a class play about a chicken. It is a similar story to Chicken Little, La poule Maboule (AIM Language Learning Kit). Because a chicken is a bird (which for some reason they giggled a lot at), and it is a great oral language piece to learn in Kindergarten. We’ve been doing journaling about the setting and about the chicken. We loved comparing her to the birds we have been learning about in our non-fiction texts and seeing outside in our playground. They thought it was interesting that she lived at a farm and not flew freely and built her own nest. Research Books: Our love and interest for birds continued to grow and I decided to guide my learners through a research series of activities using a research book template. The booklet is a half page booklet filled with research stems. We followed the stems as a whole group and used non-fiction texts to help us research. We are working on ‘Regarde partout hibou’ which is similar to ‘Eagle Eye’ reading strategy. We are learning that a picture can tell a story and share ideas. We are using little owls glued onto clothespins to mark interesting pictures, during research, that tell us information or propose new thinking. Communicating Learning: Sharing our learning with our families is an important focus of mine. I use weekly email updates and communicate a few times a week via Fresh Grade to our portfolios. Using Canva (an online tool) I created a visual documentation of a provocation activity. A student brought in a nest from home and it sparked wonderful questions, insights, wonders and stories. It also inspired others to bring in nests and feathers from home to share with us. The ripple effect was neat to witness. Art Mural: I love creating art provocations and activites for my learners to engage in revolving our inquiry learning topics. My learners were loving our paper bag birds nest provocation so much that everyone had made at least one. We decided to look on Pinterest for a fun bird art activity. I love using Pinterest with my learners to search and to be inspired; what a game changer it is to be inspired by other childrens’ work and learning! We ended up creating a large tree mural scene for our birds to perch on. I hope some of these ideas and routines can be of help to you in nurturing and following the interest of your learners. Teach slow, know your curriculum (this led to so many connections for us), listen, and really know your students and you’ll be of witness to what interest them the most. Follow it, invite and support them in exploring it, set up further provocations and document, document, document! We just visited the Family & Belongings exhibit so we are jazzed about families and objects that remind us of our families. This is where our interests and learning will be taking us to next. What is driving your learners at the moment? In what ways are you supporting them and encouraging them to go deeper with their interests? I’d love to hear and see what you’re doing. What does it mean to wear an orange shirt on September 30th? Why are you wearing the shirt? How do you go about sharing the topic of Orange Shirt day and Residential schools in your classroom? What does Orange Shirt mean to Kindergartners? Orange Shirt day is this Saturday, September 30th. For more information on what Orange Shirt Day, why we have it, and how it started please click here. Without an explanation, teaching and lessons behind Orange Shirt Day, lots of children would assume it was another school spirit day. The link would make sense in their innocent and beautiful minds, as we dressed up for our School Spirit Day last Thursday wearing black and red. The importance of introducing and teaching about Orange Shirt day is something I feel we must do. When I begin to think about introducing the topic with five year olds I have a lot of feelings. I feel obligated, sad, heartbroken, hesitant, compelled, and a bit apprehensive. In no means am I trying to be disrespectful by sharing these feelings, I am just hoping to be honest and share how I feel, why I feel this way and how I am introducing and teaching about Orange Shirt day in my classroom. I feel obligated to share about residential schools, children’s experiences, and orange shirt day because this is the history of the people whose land we live on and share. I feel that in my school experience topics surrounding Indigenous education were minimally touched on. In my own experience and my observations of my peers this resulted in a lack of understanding, connection, and knowledge of this significantly important culture. I feel compelled to share about the heartache, unfairness and suffering Indigenous people endured, and continued to endure today. We have an obligation to work towards reconciliation, my heart says we must. We, as teachers, have a duty to share true and real perspectives of Indigenous culture, both today’s and yesterday’s. The children in our classrooms deserve to understand as full of picture we can provide, the truth. We can begin a conversation about reconciliation with our learners, the future of our world. I feel a bit apprehensive to introduce this topic with such young learners as it is a big topic, full of sadness and heartbreak, but I know I must. I feel a bit hesitant as it is not my culture, and I am forever working on being respectful and not overstepping in a culture that has been repeatedly stepped over. I am hesitant, but I know this feeling must pass. I value real discussion with kindergartners and I value the truth. With all these feelings close to my heart, here is how I began introducing the topic with my Kindergartners today. A wonderful colleague of mine shared a book with me, Amik Loves School. Before reading the book we talked about what we love about school. “Friends, singing, playing, recess, dancing, learning about birds,” the list goes on. We then talked about celebrations we love to celebrate at school and with our families. “Birthdays, Easter, Halloween, Hanukkah, First Day of School, Christmas,” the list goes on. We then talked about how it feels when we are at school, and when we are participating in celebrations. “Happy, fun, laughing, excited, warm, hyper, hungry,” the list goes on. We then imagined what it would feel like if these things that we loved and were important to us, and our families, we taken away from us. “Sad, hurt, upset, crying, scared,” the list goes on. We then talked about First Nations people and how a long time ago this happened to the children when they attended school. We talked about how it must have felt for them at school, not being able to celebrate special things, not being able to see their families or siblings and not enjoying school like we do. Bit of background: We have been talking lots about how we share the First Nations People’s land. We have learned that the land we live on belongs to the First Nations people, specifically the Esquimalt and Songhees people. We are beginning to understand that we are very fortunate to share this land with them, and once a long time ago it was just their land. We have learned that people (settlers) came and took their land away from them. We have talked about how sad this would be and thought about how it would make us feel. We then went into reading ‘Amik Loves School’. This book is a great way to introduce the topic of Residential Schools to young learners. It is about a boy sharing with his family member, Moshoom, about how much he loves school. Moshoom shares that he did not love school because he attended a Residential school. He shares how his teacher was not very kind, the school was very far away, how he did not get to celebrate things that are important to his family, and more. My Kindergarten learners shared that they felt sad for Moshoom. They also shared that they wished they could invite Moshoom to our school so he could “feel fun and loved”. We talked about why it is important to remember these types of memories, even if they make us feel sad. I shared that this happened in the past, and it is something that must never be repeated. I shared that the more people that know about it, the more we can help to support people who’s hearts hurt from this and the more we can make sure it is never repeated. We talked about how everyone is welcome at our school and that we are interested in learning about everyone’s culture and celebrations. This was our conversation today. This is how I began introducing the topic. This is a real experience from a real Kindergarten class. This is a step towards reconciliation. I am grateful for my colleague, and her willingness to share her book with us. On Wednesday we will be welcoming and thanking an Elder into our classroom who is a survivor of Residential Schools. This week is very important in Education, it is our opportunity to share the truth at an age appropriate level for our learners. It is an opportunity to introduce a tough subject. It is an opportunity to step towards reconciliation, a path that will be forever long. It is an opportunity to open the hearts of young learners and involve them in this important topic. How will you be involved in this opportunity? I would love to hear what you are doing with your learners.